The global intravascular temperature management market was valued at $261,556 thousand in 2017 and is projected to reach $335,192 thousand at a CAGR of 3.1% from 2018 to 2025. Intravascular temperature management is a procedure that helps achieve and maintain a specific temperature in a patients body for a defined interval of time. It is mainly used in surgical procedures, hyperthermia, hypothermia, and others. In this treatment, a specified temperature is acquired by using intravascular temperature management systems. The system is employed to infuse hot or cold saline solution in a patients body via catheters in closed circuits. The maintenance of temperature prevents infections at the surgical site in patients undergoing surgical procedures. Intravascular temperature management is also essential in preventing pre- and post-operative hypothermia. The growth of this market is majorly driven by increase in prevalence of cardiovascular diseases. In addition, rise in number of surgical procedures performed across the globe, and surge in acceptance of intravascular temperature management across the globe significantly contribute toward the growth of the market. However, high cost of these devices hinders the growth of the global market. Conversely, high market potential in the untapped emerging economies is anticipated to provide lucrative opportunities during the forecast period. The global intravascular temperature management market is segmented into product, application, indication, end user, and region. Based on product, the market is bifurcated into system and consumables. The consumables segment accounted for the largest market share in 2017 and is expected to register highest growth rate during the forecast period. Based on application, the market is categorized into preoperative care, operative care, post-operative care, and acute/critical care. The acute/critical care segment accounted for the largest market share in 2017, while the preoperative care segment is expected to register the highest growth rate during the forecast period. Depending on end user, the market is classified into surgical centers, emergency care units, ambulatory surgical centers, and other. The emergency care units segment held the largest share of the market in 2017, whereas the ambulatory surgical centers segment is expected to register the highest growth rate during the forecast period. Based on region, the global market is studied across North America, Europe, Asia-Pacific, and LAMEA. North America held the largest share of the market in 2017, followed by Europe. On the other hand, Asia-Pacific is anticipated to dominate the market during the analysis period owing to rise in disposable incomes and increase in prevalence of cardiovascular disorders. Key players profiled in the report include 3M Company, Asahi Kasei Corporation., Belmont Instrument Corporation., Biegler GmbH, Geratherm Medical AG, Smiths Group Plc., Stihler Electronic GmbH, The Surgical Company BV, and VYAIRE MEDICAL INC.
Other players (these players are not profiled in the report and the same can be included on request) in the value chain include EMIT CORPORATION., Barkey GmbH & Co. KG, and Keewell Medical Technology Co. Ltd. The study provides an in-depth analysis of the global intravascular temperature management market with current trends and future estimations from 2017 to 2025 to elucidate the imminent investment pockets. Intravascular temperature management is a procedure carried out to maintain normothermia in a patient. The procedure involves the use of a system that supplies hot or cold saline through a catheter, which results in cooling or warming of blood fluid. The procedure is carried out in various phases of surgery, such as the pre-operative phase, the post-operative phase, or during the surgery, for the prevention of surgical site infections and to achieve better treatment results. 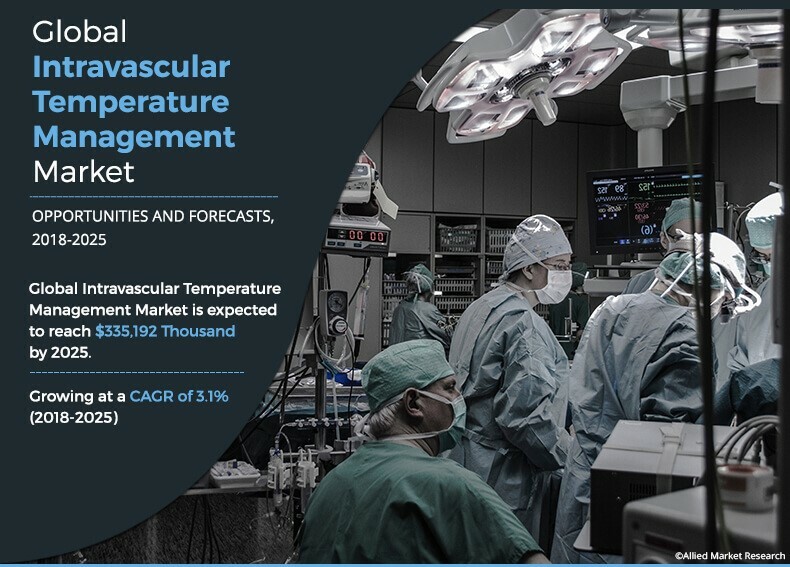 The rise in number of surgical procedures is the major factor that drives the growth of the global intravascular temperature management market. Relevant factors, such as increase in awareness related to maintenance of normothermia among healthcare providers and rise in prevalence of cardiovascular disorders, are expected to significantly impact the growth of the market. However, high cost of intravascular temperature management system is anticipated to impede the market growth. The use of intravascular temperature management is the highest in North America, owing to high purchasing power and easy availability of intravascular temperature management devices, followed by Europe and Asia-Pacific. Moreover, rise in number of surgical procedures performed in this region contribute toward the growth of the market. In addition, instrument manufacturers are focusing on expanding their presence in the emerging economies, which is anticipated to drive the market growth.